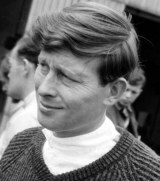 A former RAF officer, John Taylor took part in five championship Formula One races, putting together a decent run of form in a privately-entered Brabham in 1966, with a sixth in France followed by a brace of eighths. However, at the German Grand Prix he collided on the first lap with the Formula 2 Matra of Jacky Ickx, his car bursting into flames. He was rushed to hospital with 50% burns where he died five weeks later from his injuries.